Every part of the trip was great! Western River Expeditions takes care of everything from the bus ride to the airport to meals on the beach. 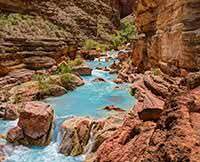 This is our second trip down the Colorado River through Grand Canyon and I would not consider any other company.